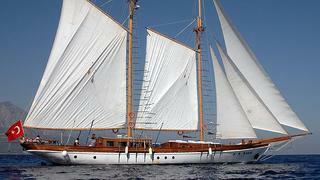 A call to Nihan Deniz at Aegean Yacht brings confirmation that she's listed the 30m sailing yacht Okan for sale. Built in wood in 1992 and refitted in 2011, Okan sleeps 10 guests in five staterooms and is powered by a 540hp Caterpillar engine. Lying in Antalya, Turkey, Okan is asking €330,000.